Solid Shampoo Bars Devon UK- All Natural & Vegan. This lightly scented bar is made with hair loving oils believed to increase hair growth. Lemongrass is also believed to be excellent for dandruff. These beautifully scented handmade solid shampoo bars are made in Devon with natural ingredients and scented with essential oils. I specifically chose these essential oils as they are all fantastic for the hair and scalp as they encourage hair growth. This listing is for one Orange, Lemongrass, Lavender, Orange, Pine & Patchouli, Vegan Shampoo Bar. Like my soaps they are made in small batches and are approximately 70g. As I cut these by hand they are usually a lot heavier!! They are individually wrapped in paper meaning there is zero waste as all packing is recyclable. In addition, as the bar is solid it doesn’t need a plastic bottle. Wet hair thoroughly then either rub the bar directly onto the hair, or into the hands. Massage the shampoo through your hair to clean the hair. Rinse well, repeat if necessary. If you blow dry your hair use cool air to get the best results. This is especially important during the transition period. Please note these bars contain no SLS or synthetic ingredients therefore the lather will be different to what you are used to. 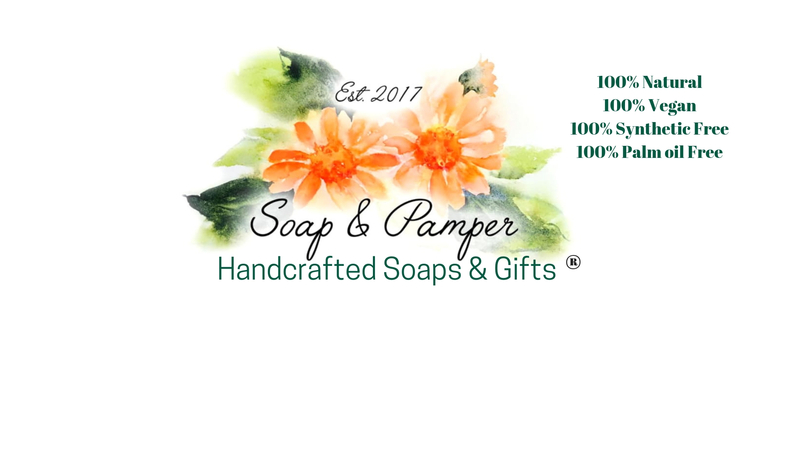 All shampoo & soaps bars at Soap & Pamper are handmade by myself in Plymouth UK using ingredients that are 100% natural, palm oil free and vegan friendly. I use the traditional cold process method to make all my solid bars. If you are planning on taking this bar to the gym and using it in a public shower take a look at this sisal soap saver.